I mean, it’s not even nearly Easter yet. But with the nation’s leftover Christmas selection boxes well and truly depleted, it’s time to look towards new chocolatey horizons. Fortunately, you don’t have to wait until the Easter Bunny comes hopping down your street (on April 21, to be exact) to enjoy some Easter oriented treats. 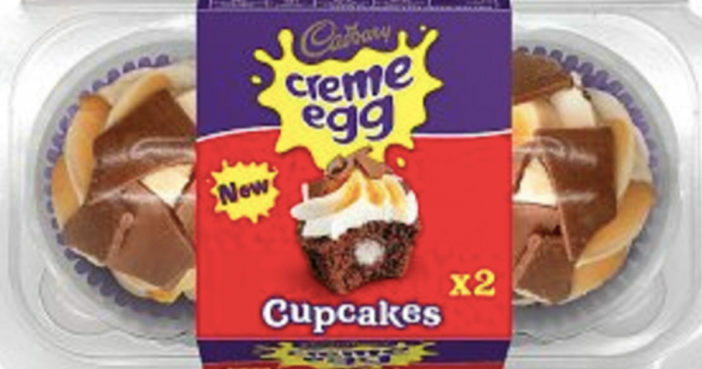 Iceland is now selling Creme Egg Cupcakes, which look utterly adorable and personally fill me with a tasty mixture of egg hunt nostalgia and tired adult cravings. A box of two cupcakes will set you back £2, so a little more on the pricey end of the scale. But split a box with a friend and this becomes a doable Friday afternoon pick-me-up, Easter time or not. Of course, for those trying to be thrifty, you can grab a box of 12 iced – non Creme Egg – cupcakes for £4 at Iceland, which works out at a far more reasonable 33p per cupcake. You can also pick up a box of nine fairy cakes – non iced – for £1.50 for nine, which works out at a pleasantly snippy 17 pence per cake. But for those with a curious appetite and a couple of quid to spare, Creme Egg Cupcakes will undoubtedly prove to be a satisfyingly creamy bath for the tastebuds. Let’s examine. The chocolately sponge of the cupcake is filled with the gooey fondant filling which is instantly recognisable as the iconic innards of a Creme Egg. That weirdly decadent, distinctive feeling when you bite into a Creme Egg and the inside of your mouth is instantaneously coated with Creme Egginess? That is all present and correct, except in cake form. The top of the cupcake is quite appealing to the eye, with a sugary whirlpool of vanilla buttercream, topped with fragments of milk chocolate and the unmistakable orange of the Cadbury’s Creme Egg ‘yolk’. Now, at 240 calories per cupcake, it obviously isn’t recommended that you swap your morning egg and soldiers for these naughty little temptations. Indeed, with 26.1 grams of sugar per cupcake, it’s probably best not to scoff both in one dreamy eyed sitting. However, one surely won’t hurt? Yes it’s January. Yes many of us are currently huffing and puffing around in drizzly parks in pursuit of the collective ‘new me’. And this cyclical stab at self-betterment is of course to be applauded.